Merchant Navy Class - 35008 'Orient Line' - in 5" Gauge. As a young boy between the ages of 7 and 14, I was living on a farm between Harrietsham and Hollingbourne in Kent. Being adjacent to the Southern Railway tracks running between London Victoria, Maidstone East and the Ashford line, I took a great interest in all things railways. 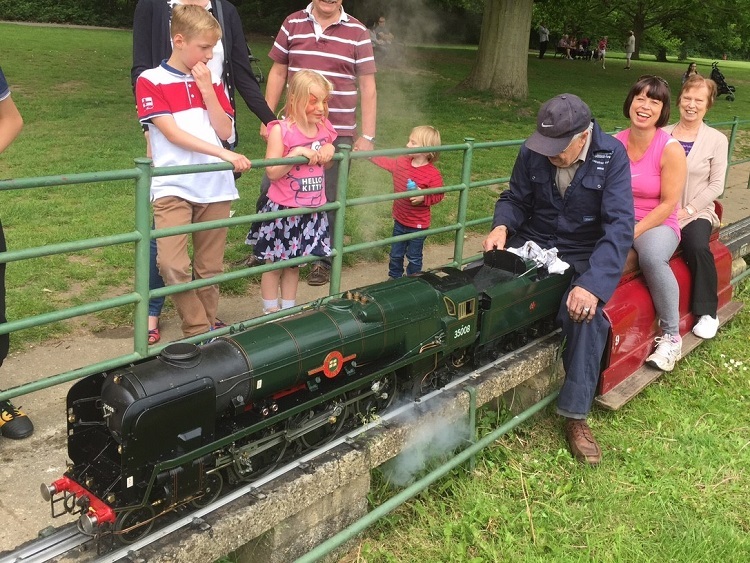 The family moved to Maidstone (also in Kent) in 1949 and I soon joined the Maidstone Model Engineering Society. I set up a workshop in an old coal shed outside, and saved up and purchased a brand new ML7 lathe for the princely sum of £65.00 including a motor, 3 and 4 jaw chucks and vertical slide - which I still have. 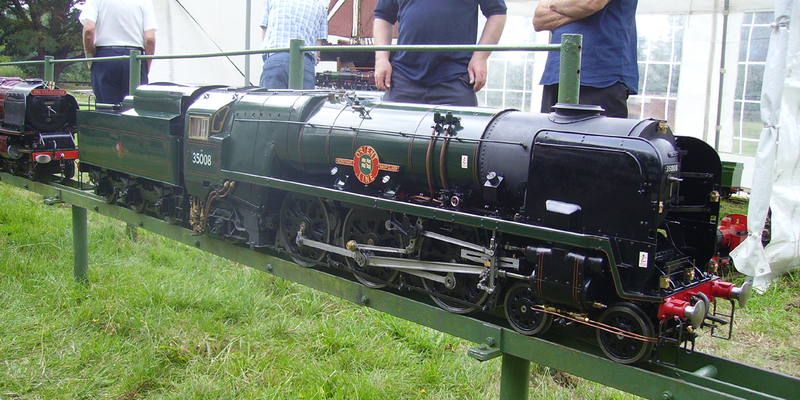 I built a 3½" gauge Juliet when aged 16-18, while working as a junior chemist at Style & Winch Brewers. But I preferred engineering to chemistry, and transferred to AE Gardeners, Maidstone, and became time served. Next came 2 years of National Service, and during this time LBSC described a Britannia in 3½" gauge - I was hooked. So I purchased some BR main outline drawings and started on frames, etc. After many stops and starts over the following years, it progressed very slowly. On retirement, I made a big 6 month effort and finished in 2000, just in time for the Model Engineer exhibition, where it won a silver medal and the J.N. Maskelyne Trophy. In 2003 it won the Australia Award at the Autumn Southern Federation Rally, and in 2004 also won the LBSC (Curly) Bowl. But having lived on the edge of S.R. lines and built a 'Brit', Keith Wilson’s 5" Gauge loco 'Ariel' took my fancy. Rebuilt Southern Railway Merchant Navy’s are similar to "Brits", which borrowed much from Bulleid's design. I knew 'Ariel' would be a complicated loco to build and would test all my skills, and it certainly has some. As the full-size was an all welded design and manufacture, the model has tested my ingenuity to make the 1/12 scale version look 'welded', if you see what I mean. Adrian Gurr and I, Maidstone MES members, each started to build a Merchant Navy as parallel projects, but sadly Adrian died of a brain tumour never to finish his. I'm now building mine partly in his memory. 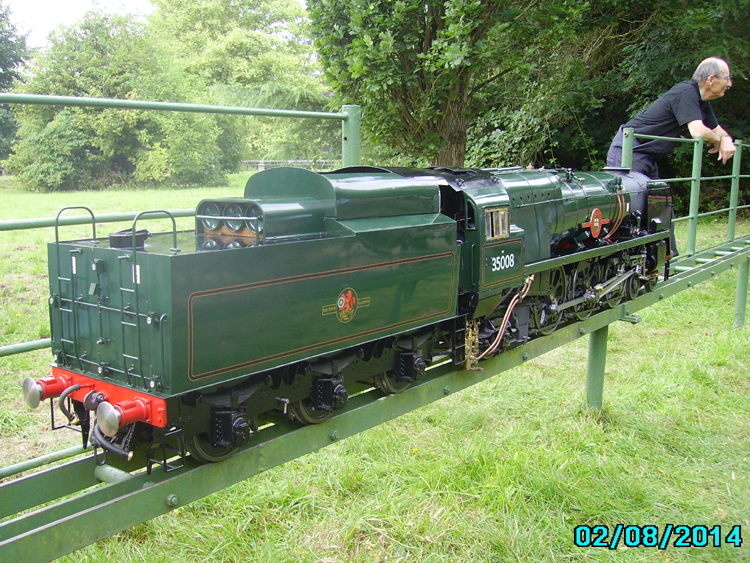 Some day, hopefully, his loco will be completed by Tom Parham, a Maidstone MES member who was left the part built loco by Adrian. I've named my loco "Orient Line" - 35008, as returning from Australia in 1936 as a 4 year old, my parents and I sailed on the 'SS Orontes' which was on the Orient Line. 1990. Sets of wheels cast to 'open' patterns locally. 1992. Wheels machined to receive inserts (water cut). Inserts bonded and screwed to wheels to produce correct "boxpok" effect; balance weights added. Tender, bogie and trailing wheels given same treatment. 2001. Main frames, bogie and tender frames water cut to profile as per M.E. drawings. All chassis stays bent and formed on ally formers. Outside motion brackets, outside guide bar brackets etc. All parts hand profiled (each 25-30 pieces) in every case to suit brazing. Assembly fixtures made in each instance. Each unit was No. 2 silver soldered in one hit on fixtures, sand blasted and primed. was silver soldered using oxy/propane. The boiler was tested to 200lb PSI. No problems. 2004. Cylinder castings were to be fabricated, but to cut time and make things easier in the confined space, MJ Engineering castings were purchased. A very nice piece of foundry work they were. These were machined on a Myford ML7 and Senior M1 Mill, bores honed, and my own piston rings manufactured, fitted to main bores; with just oil grooves on piston valves. Bogie and trailing frames were fabricated and brazed in fixtures using oxy/propane. Coupling rods and connecting rods inside and out made from heat treated bright bar (heated in own house log fire). Fixture made to hold all rods on milling machine during manufacture. I think I ended up with more swarf than rods. Both sides of rods fluted using in-house made milling cutter with radii etc. made from tool steel. Wheel setting to 3 cylinder angles using M1 mill dividing head and slips saved making a large fixture and worked to specification. All leaf springs are hand made from phospher bronze 20 SWG strip 3/8 wide. The axles all run in needle rollers, and expansion links on ball bearings. 2005. Tender chassis completed with full vacuum braking as per prototype. 2007. Tender body: all brass soft soldered with baffle plates etc. This is almost complete, with working cupboards and coal hood to finish. The front section will also lift out to allow driving access. Four radiant super heaters have been constructed, and the boiler cladding is being assembled. Also the cab and running plates are in hand. The ashpan is manufactured from 20 SWG stainless steel. This is a very complicated item, all silver soldered with working vent and ash release etc. It would be nice to think it will be completed this year, 2007, but as you all know, things do upset the best laid plans. But here's hoping, given clearance from ‘Management’ and continued health. The full size '35008' was rebuilt in 1957, but unfortunately scrapped in 1965 - very sad. Hopefully it's namesake will be steaming in the Southern heartland before too long.